Atlona’s OmniStream line of AV-over-IP products is now shipping and available for orders through authorized OmniStream partners. 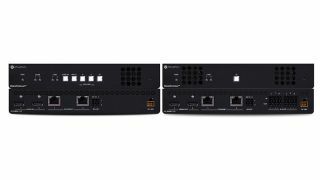 The OmniStream family consists of five distinct products to integrate and distribute 4K/UHD video, audio, and RS-232 control over Gigabit Ethernet networks, employing off-the-shelf network switches. According to the company, the OmniStream line offers several industry-first features, including high-density, dual-channel encoding and decoding; redundant AV networks and streams; encrypted content distribution; network error resilience; broadcast-quality 4K video compression with extremely low latency; and the ability to convey 4K video and Dante audio simultaneously over the same network. According to Shamir, OmniStream’s network-based approach enables virtually unlimited scalability and low-cost integration, benefits not available with conventional matrix switching technology. He said the new line is well suited to interconnecting AV between multiple rooms and floors, over an entire building, and across a corporate or university campus. An AV industry first, according to the company, dual-channel encoding and decoding allows each OmniStream 112 and OmniStream 122 to process two independent 4K/UHD video streams in a single, half-width rack enclosure. This allows Atlona to increase cost-per-channel value and provide the benefit of a high-density rack installation. The dual-channel components can also be configured for system redundancy, with each encoder and decoder handling two simultaneous streams of the same HDMI source. The two independent streams are encoded and decoded simultaneously, and when a physical or logical connection fault is detected in a primary stream, the decoder automatically switches over to the backup. OmniStream features SMPTE VC-2 video compression (SMPTE 2042), a visually lossless codec originally developed by the BBC for high quality imagery in master control video distribution as well as post-production and archiving. Additionally, OmniStream delivers the lowest encode-to-decode latency of any pro AV industry codec, according to the company, with half a video frame or 9ms delay for 60Hz video signals, making it well suited for applications requiring tight audio and video synchronization, such as live streaming. For optimal performance and reliability, OmniStream features SMPTE 2022 forward error correction for protection against packet loss and the resulting signal dropouts, which can occur in large-scale applications spanning several networks. It also features selectable AES-128 encryption for securing sensitive or protected content in government, military, healthcare, and corporate environments. All OmniStream AV encoders stream HDMI embedded audio, including Dolby and DTS multichannel bitstream formats. In addition, the OmniStream 232 Dante network interface can be used for transmitting and receiving two-channel audio over the network. The OmniStream 232 also integrates sources such as microphones and PCs into a third-party audio DSP as well as a larger Dante system. Advanced projects with a combination of OmniStream devices can be employed to simultaneously route AV over IP and Dante audio signals over the same network. OmniStream is designed with a host of features for streamlining and optimizing AV integration. Decoders feature high-performance 4K upscaling and downscaling with 4:4:4 video processing to preserve full color integrity of computer-generated content. Decoders also can downmix multichannel audio and deliver de-embedded two channel audio outputs. Automatic display control is available at the AV encoders through RS-232 and CEC. In addition, OmniStream offers the option to display a user-supplied logo, a full-screen image, or scrolling text. To simplify system integration and minimize costs, OmniStream devices can be powered using a PoE-equipped Gigabit switch as well as a dedicated power supply. They are configured using the free Atlona Management System (AMS) software, which serves as a centralized portal for managers or system administrators to monitor and manage an enterprise-wide OmniStream system.